PI Sydney Brennan’s first error in judgment: performing a background check for her ex-boyfriend. 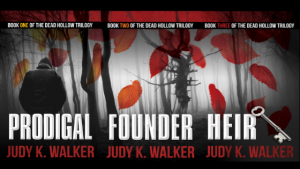 Her second: delivering the report in person to his upstate New York home, where a man is murdered shortly after her arrival. 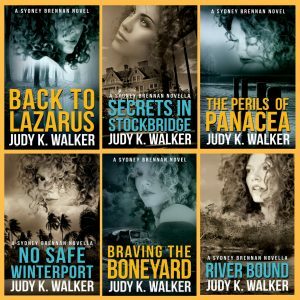 Will believing her ex is innocent be the third error that leads to another murder? 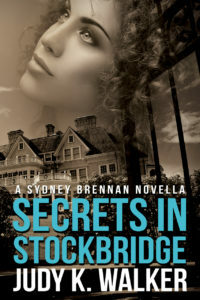 Following is the first chapter of Secrets in Stockbridge: A Sydney Brennan Novella, the second book in the Sydney Brennan Mysteries series. If you were a professional accountant, would you agree to prepare your ex’s taxes? For other than revenge purposes, I mean. If you were a baker, would you agree to make his wedding cake? For other than revenge purposes, I mean. If you were a plumber, would you agree to fix his toilet? For reasons other than a court order to fix the damage you had inflicted, I mean. You get the idea. So what the hell was I thinking when I allowed my ex-boyfriend Bran Woodford (yes, that’s his real name) to hire me to do an investigation? I wasn’t thinking about revenge, but I wasn’t thinking smart either. I guess I just wasn’t thinking. I’m a private investigator in Tallahassee (which is in north Florida or south Georgia, depending on who you ask). Bran lives in upstate New York. We dated long ago when we were both living in Boston after college. Our breakup wasn’t particularly acrimonious. At the time, I decided the occasional perks of dating a trust fund baby didn’t outweigh the everyday reality of dating a trust fund baby. He didn’t take it personally. Of course, he didn’t take anything personally. Did I mention the trust fund baby part? Don’t get me wrong—Bran wasn’t a bad guy. He’d just never really had to be a good guy. I’d heard a little about Bran and his exploits (from friends, not tabloids—the trust fund wasn’t that big) but hadn’t actually heard from him in over ten years. He called out of the blue recently, opening with a few minutes of casual chitchat before segueing into “so I hear you’re an investigator” and culminating with an offer I didn’t have a good reason to refuse. His request seemed simple: a background check into a man his aunt Jeanette was dating. Also in his favor, he called at a time when my coffee kitty, along with the rent and other less important funds, was dwindling. On top of that, I hadn’t been vaccinated in a while (yes, that’s a euphemism), so my resistance to his considerable charm was pretty low. So let’s summarize. An old friend, with whom I just happened to have been intimate, currently living a thousand or so miles away, asked to pay me real money for work that I regularly do, work that would require no more contact between us than a brief phone call from me advising that a report was on the way. An old friend whose check wouldn’t bounce. Still think I was stupid? Of course I was. The background check was relatively straightforward, as I had hoped. The brief phone call advising that my report was on the way was not straightforward. In fact, that’s where things got complicated. “Sydney—thank God!” A more enthusiastic response than I was used to, but maybe it meant I’d get a bonus. No response. Waiting people out is an investigative tool I’d spent years honing. Unfortunately Bran is a savant, and he outlasted me. Another little white lie. I could go; I just didn’t want to go. And I was not going to speak first this time. Seconds ticked away. Metaphorically. Where’s a good old-fashioned non-digital clock to stare at when you need it? Obviously not in my office. Maybe I should buy one. And some new blinds for the front windows that face the street. Mine were looking a little tatty. My office chair was on its last legs (so to speak) as well. Every once in a while the chair would start slowly creeping toward the floor on its own, so slowly that it gave me Lilliputian panic attacks. I probably wouldn’t get them if I were a little taller to begin with. I quickly flipped open my day planner, skimmed through it, and glanced at the calendar on my desk. I really could fly up there. Put off some paperwork. Take a break from the Florida heat. Avoid the legislators and their circus—wait, they weren’t in session now. Okay then, help a friend in need. “I can get you in a Dugout Box, close enough to smell the sweat,” he offered. I tried to sound grudging in my acceptance, but I don’t think I was very successful. Bran knew there’s very little I won’t do to go to a game on the rare occasion I’m within a couple hundred miles of Fenway. Make it a Dugout Box and the list gets even smaller. That evening I nearly wore a groove in my floor walking between the closet and the bed, deciding what to pack. I tried to tell myself it was because I was going to a different climate, but come on—summer is summer. No weather in New York would be more challenging than the juxtaposition of Tallahassee’s heat and humidity with the extreme air conditioning de rigueur for all buildings in the capital. It wasn’t the weather I was trying to dress for; it was my ex-boyfriend. Or more accurately, his fiancée. Bran and his fiancée and his aunt Jeanette and her fiancé James and who knows who else—oh yeah, me, with no fiancée —would be staying at the Woodford house. I wasn’t sure what cover story Bran had for me, but experience had taught me great respect for Bran’s abilities of fabrication. Which brought me back to—fiancée! Who the hell would marry Bran? Impossible to say, since he’d managed to hang up without even giving me a first name. Come to think of it, meeting the woman who could get Bran to the altar was worth the entire trip. Although I hear he’d had a few near-misses, so she shouldn’t count her half of the trust fund until it hatched. I laughed out loud and felt my wardrobe dysfunction melt away as I threw my usual road uniform (jeans and button-down white shirts) into a carry-on. My only fashion concessions were to pack some nicer camisoles, a couple of scarves to tame my crazy red hair, and one cool summer dress, in case the heat and/or social pressure got to be too much for me. My flight the next morning was about as straightforward as it could be, considering I was flying last-minute from Tallahassee’s regional airport (seriously—what other state capital has a regional airport?) to Albany. Which means it took me seven hours. I remember Atlanta and Detroit, and I think maybe the International Space Station was in there somewhere. Thank goodness I had packed light—it made the cross-terminal sprints easier. On the bright side, I had plenty of time to review my notes and get my head on straight during the trip. James Marshall had been upfront with Jeanette about the skeletons in his closet, including his conviction for check fraud under his previous name, Jimmy Smith. I confirmed that he’d served a couple of years in Broward County, Florida, back in the mid ‘90s, and I didn’t find any other criminal convictions under either name. The Florida connection is one of the reasons Bran gave for calling me, and there was some logic to that. Once I’d exhausted all of my paper trails, I’d put out some calls and eventually got someone who’d been an investigator for the Broward Public Defender’s office at the time James was convicted. Simon Marshall (no relation to James) is a guy who runs counter to stereotype. With his English accent and silver-haired good looks, Simon is more likely to be cast as a high-class jewel thief than a lowly PD investigator. The sounds of Simon fiddling at his desk were audible over the phone. He’s notorious for keeping all his office memos in a tray and cutting them (unread) into mini paper doll chains while talking on the phone. Being so good at his job and close to retirement, no one higher up found it worthwhile to do anything about it except designate juniors to fetch Simon for crucial meetings. I still couldn’t resist a little dig. “Okay, so you didn’t believe the victim. What else was off?” I asked. A speechless Simon Marshall was a first in my experience. I didn’t have a problem with someone getting a name change (Sydney Brennan isn’t the name I was born with either), but I also hadn’t inspired a felon to adopt my last name as his own.